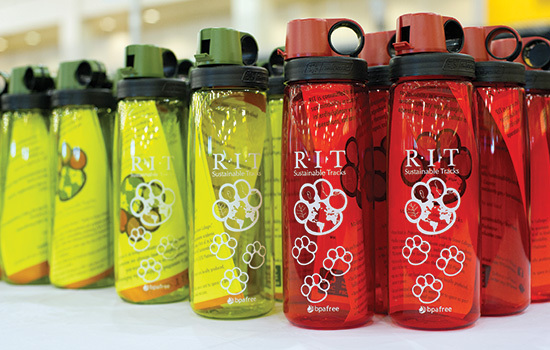 RIT has implemented a new policy in which departments and campus groups will no longer be allowed to use university funds to purchase single-serving bottles of water. Bottled water will still be available for sale in vending machines, at sporting events and in retail locations on campus if individuals choose to spend their own money. Water fountains are abundant on campus and water is available at fountain locations in dining centers at no cost. “In a time when we are increasingly mindful of the rising cost of education and are working hard to enhance campus sustainability efforts, this move just makes sense,” says RIT President Bill Destler.